Ella is also currently working on a vast project for the Mahamudra Center in NZ. 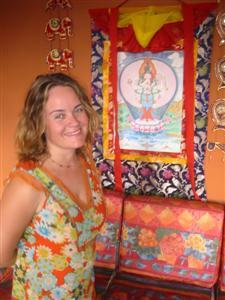 She will paint an image of each teacher from the Mahamudra lineage. This is part of Lama Zopa's vision for the Mahamudra Center. Should you wish to make a financial contribution towards this project, please contact Ella. In traditional Tibet, Thangka painters were never out of work because they were constantly commissioned to produce paintings to commemorate important events, such as the birth of a child, the death of a loved one or the start of a business venture. In particular, a painting would be commissioned for anyone going into a retreat. The person commissioning the painting receives as much merit as the painter. This is because producing such a work is an interdependent relationship - without the patron, the artist cannot work. According to Tibetan tradition, images of Buddhas are not bought or sold - the artist is paid only for their labor and the cost of materials. Prices shown below in New Zealand Dollars, use xe.com to convert currencies. Labor is charged at NZ $12.00 per hour, materials include pure pigments & 24-carrat gold. The following table shows example prices only. Thangkas may be supplied in a traditional Tibetan brocade (see photo), with prices starting at $60. 1/3 of the total cost is paid upon agreement of commission. A further 1/3 is paid during production of the thangka, and the final 1/3 is paid on completion. To obtain a more accurate estimate or commission a painting, please contact Ella.